Footage of the attack showed Swami Agnivesh being chased and pushed by a group as he keeps walking, trying to get away. 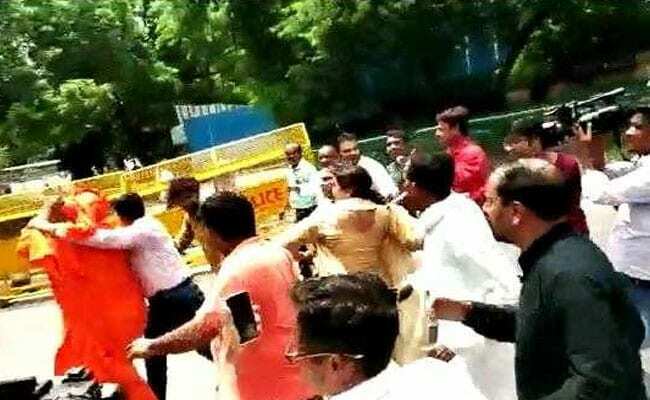 After social activist Swami Agnivesh was attacked near the BJP headquarters in Delhi on Friday, a case has been filed by the police against unidentified persons. The case was filed after a complaint was submitted by one Vithal Rao on behalf of Swami Agnivesh at the Parliament Street police station, news agency PTI reported. The attack was captured on camera. "I had gone to pay my respects to Vajpayee ji. Because of the police pickets, I had to walk down the last stretch... suddenly a group of people came and attacked us. There were two-three of us and they were quite a few. They beat us, pushed us around, abused us and knocked off my turban," Mr Agnivesh had told NDTV on the phone on Friday. "They kept shouting 'he's a traitor, he's a traitor, beat him'," he added. Footage of the attack showed Mr Agnivesh being chased and pushed by a group as he keeps walking, trying to get away. His turban is yanked by one man and a woman is seen holding her slipper, as if ready to strike at him. Even as police tried to move the activist to safety in a van, the mob tried to hit him as it drove off. In the complaint, Vithal Rao alleged that despite police presence, the attackers continued their assault, adding that this was against law and democratic values, police said. Mr Rao also sought police security for the social activist. This was the second time Swami Agnivesh was assaulted in a month's time. On July 17, Swami Agnivesh was punched and kicked by a mob allegedly of BJP workers in Jharkhand's Pakur. No arrests have been made in that case yet.